Adnoc Distribution, the UAE’s largest fuel and convenience retailer, said its shareholders have approved a significant increase in the company’s dividend policy in recognition of its strong financial performance and cash position in 2018, as well as its confidence in the company’s strong growth prospects and cash flow generation ability going forward. Under the new policy, the company will increase its annual dividend payment, starting in 2019, as follows: An annual dividend for fiscal year 2019 of Dh2.39 billion ($650 million), equivalent to Dh0.1910 per share and a 63% increase compared to 2018. The annual dividend for fiscal year 2020 will rise to Dh2.57 billion ($700 million), equivalent to Dh0.2057 per share. This will be a 75% increase compared to 2018. As per tthe new p;olicey, the shareholders will get a minimum payout of 75% of distributable profits from 2021 onwards. Adnoc Distribution said it will continue to pay half of the annual dividend in October of the relevant year and half in April of the following year. Backed by a long-term, sustainable growth plan and supported by a solid balance sheet and strong cash flow generation, the new policy reflects the shareholders’ trust in the company, following its robust financial performance in 2018, during which the Company reported Dh2.128 billion in net profit, an increase of 18% from 2017, it added. Adnoc Distribution shareholders also approved a second and final dividend payment of Dh735 million (Dh0.0588 per share) for the year ended 31 December 2018. This dividend payment comes on top of an initial Dh735 million (Dh0.0588 per share) dividend payment for the year, which was paid in October 2018, resulting in a full-year dividend of Dh1.47 billion (Dh0.1176 per share), consistent with Adnoc Distribution’s commitments to its shareholders at the time of its initial public offering (IPO). On the new move, Chairman Dr Sultan Ahmed Al Jaber said: "Adnoc Distribution’s impressive 2018 performance illustrates the company’s strong financial position, with an enhanced level of profitability, healthy margins, and strong cash flow generation." "The new dividend policy approved today demonstrates our commitment to our shareholders and our confidence in the Company’s future prospects and growth strategy. As we expand the Adnoc Distribution business, we will continue to look at both organic and inorganic growth options to deliver ambitious, but disciplined growth that delivers attractive returns," stated Dr Al Jaber. Adnoc Distribution delivered on its 2018 commitments, opening 19 new stations which contributed to increases in revenue and ebitda of 16% and 22% respectively. Acting CEO Saeed Mubarak Al Rashdi said: "Adnoc Distribution is operating from a position of strength. Our balance sheet is strong, and we continue to generate significant cash flow. We have an extremely compelling investment proposition that we expect to continue into 2019 and beyond with up to $300 million of CAPEX earmarked for further growth 2019." "We successfully implemented our 2018 strategy by providing more choice to our customers, improving our convenience store offering, and being more cost efficient. In addition, we focused on transforming our internal structures, processes and culture to ensure that we harness all of our employees to drive high performance and sustainable growth," noted Al Rashdi. At the General Assembly, shareholders also approved a plan to allow Adnoc Distribution to implement a share buyback scheme. 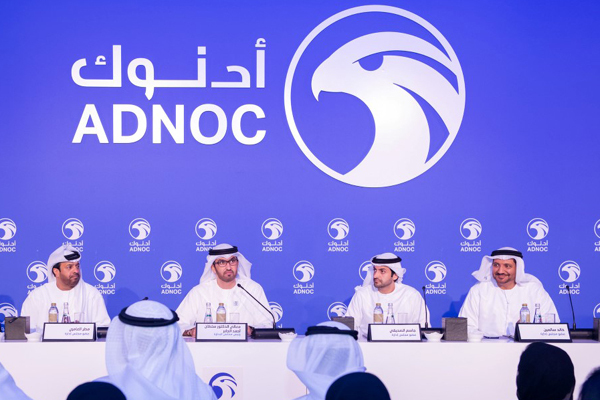 The option, which remains subject to approval of the UAE Securities and Commodities Authority (SCA), would allow Adnoc Distribution to buy back up to 62.5 million shares, equivalent to 5% of its free float, during a twelve-month period, should it choose to do so, he stated. The Emirati company said the approval of the share buyback reflects the board’s opinion that the stock was trading below levels consistent with its view of the Company’s growth prospects. If implemented, advance notice of the plan would be announced in accordance with SCA regulations, it stated.